Grind the biscuits and mix in the melted butter with it, until it forms crumbs. Line the base of the serving dish with the biscuit mixture and press gently. Put in the fridge to set for an hour. Prepare hung curd using a muslin cloth. Beat whipping cream until it forms stiff peaks. 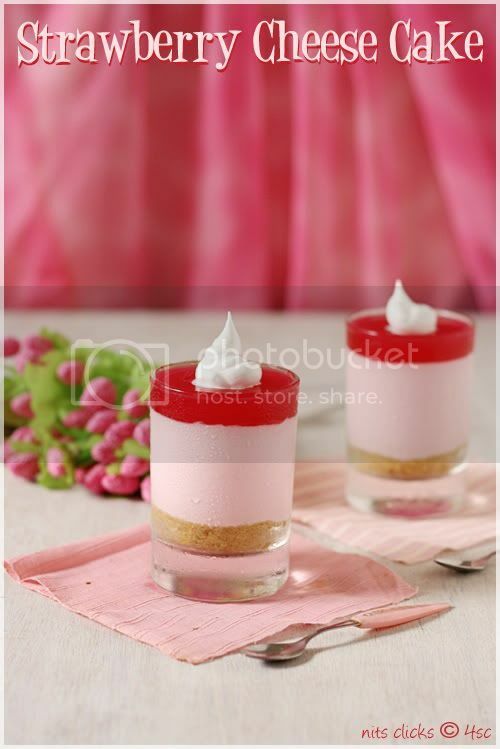 Fold the cream, hung curd and 1/2 cup of strawberry crush together until it blends well to make a smooth mixture. Add 4 tsp of water in 3 tsp gelatin and microwave at high for 30 seconds or until completely dissolved. Then pour the gelatin slowly into the strawberry mixture. Keep stirring continuously.Now pour the strawberry mixture onto the set biscuit base.Cover and put in the fridge to set overnight. Take a bowl with 1 tsp of gelatin and pour 2 tsp of water and microwave for 30 seconds. 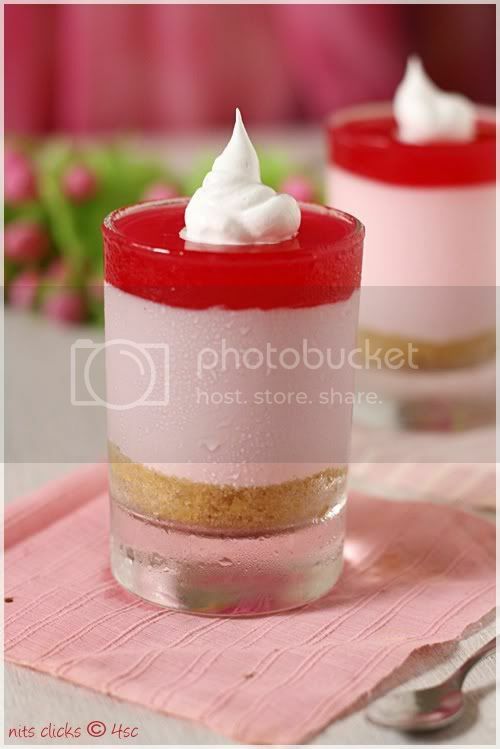 Mix in 1/4 cup of strawberry crush and pour on top of the cheese cake layer and refrigerate for 3 hours. Serve chill with some whipped cream topping. Nithya, wow... very lovely presentation and delicious cheese cake. I don't mind to have one right now. :) Have a nice day. 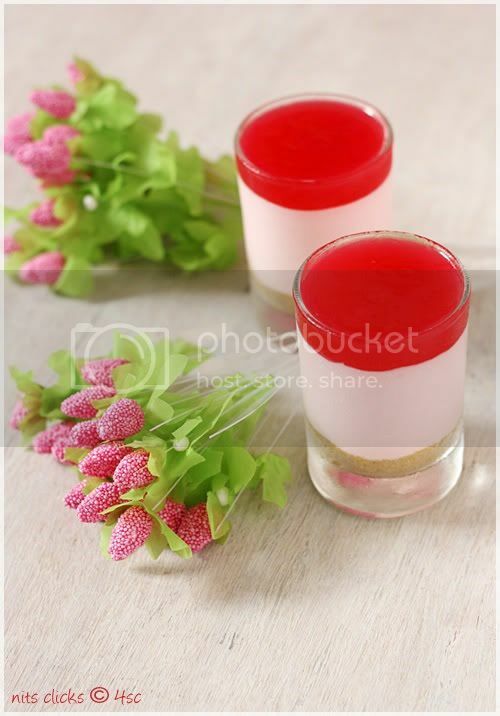 Elegant and super inviting cheese cake,looks marvellous.. IT LOOKS SO PERFECT AND TEMPTING! OMG that's awesome.Looks yummy and delicious too.The pics are tempting to grab it from the screen. Looks Beautiful :).....would love to taste it. Gorgeoussss pic...the pinkness of the entire pic is so enticing !! I too adore cheesecake.. I will make this one but I do not think we will have the patience to wait for this yummy dessert for 2 days. If I know my daughters I will find fingers dipped in the glasses and if i know my hubby i glass will be eaten up before hand. But I will make it for sure. Wowww... beautiful pictures.. Yummy !! Absolutely inviting..especially the top layer!! Looks yummy..by the way what is Hung curd ??? I have drawn inspiration from your blog.. Congrats on your book. If you can share you experiences on how you did the book, it would be helpful for fellow bloggers. Wow!!! Nits, amazing and mindblowing snaps. This is a perfect dessert to serve after a lovely meal. That's way i never keep away from my cravings he he. Strawberry cheese cake is salivating nithi. I am drooling over that pic. Looks like something out of a food mag. Amazing. I am a long time reader of your blog. But have never commented before. 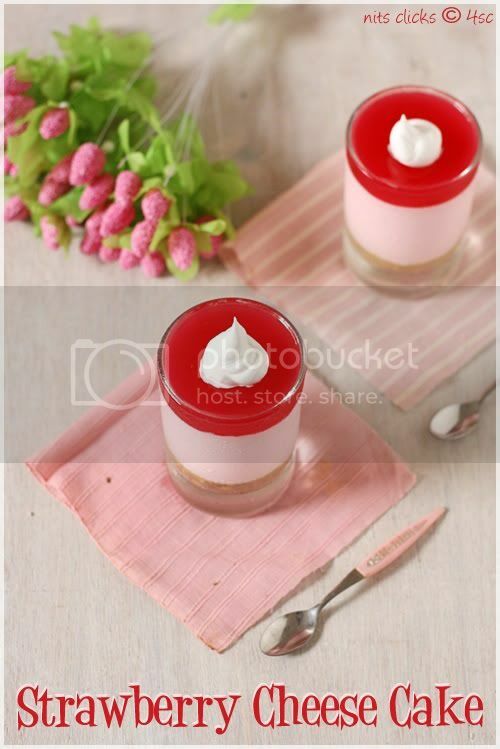 You have a great blog with lovely recipes and great photos! I have a question regarding this recipe. If I use hung curd in this recipe will it not turn sour in a day? What will be the shelf life of the cake if I use hung curd? Please let me know. @ Priya - Thank you so much for following my blog. The shelf life of cheese cake is generally 3-4 days and you need to keep them in refrigeration. They dont turn sour until 4 days and I bet you would never have to keep them for that long, they are super delicious and will keep you tempted always. Did you know you can shorten your long urls with Shortest and receive money for every visit to your short urls.